We’d love your help. 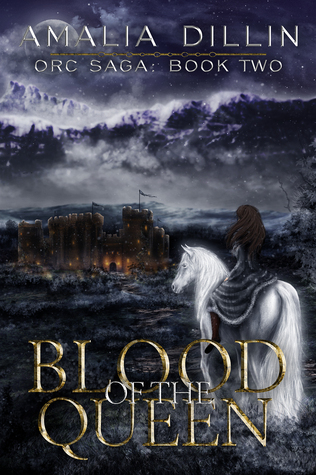 Let us know what’s wrong with this preview of Blood of the Queen by Amalia Dillin. Less Beauty and the Beast and more Tolkien, this second Orc Saga adventure will force Arianna and Bolthorn to overcome their greatest fears, with the life of their unborn child and the safety of their world hanging in the balance. Princess Arianna never wanted to return to her human kingdom of Gautar. Not after she helped murder her abusive father to escape. Not since the o Less Beauty and the Beast and more Tolkien, this second Orc Saga adventure will force Arianna and Bolthorn to overcome their greatest fears, with the life of their unborn child and the safety of their world hanging in the balance. The Ancestors, however, have other plans. Bolthorn's kin disappeared through the mountain passage to Gautar months ago and Arianna won’t abandon any orc to the cruel mercy of her father’s people. Just as worrisome, Arianna’s sister is trapped within the castle, a pawn and plaything of the new king. To ask other readers questions about Blood of the Queen, please sign up. Love... Love... Love... this book jacket! Anyone else? Amalia Dillin’s second entry to the Orc Saga is the beginning of an odyssey. In the manner of an odyssey, Arianna’s and Bolthorn’s journey is at turns plagued and enriched by altering fortunes. Dillin weaves the tale of a young woman’s perilous trek where the early dangers she confronts have her cowering in fear, yet she ultimately embraces her power and primacy. Arianna’s pillar of strength is her husband, and the romance of this book centers around their everlasting and expanding bond. They te Amalia Dillin’s second entry to the Orc Saga is the beginning of an odyssey. In the manner of an odyssey, Arianna’s and Bolthorn’s journey is at turns plagued and enriched by altering fortunes. Dillin weaves the tale of a young woman’s perilous trek where the early dangers she confronts have her cowering in fear, yet she ultimately embraces her power and primacy. Arianna’s pillar of strength is her husband, and the romance of this book centers around their everlasting and expanding bond. They teach each other what sacrificing love and freedom can mean. The newly married human/orc couple is determined to leave the relative safety of the cold Hrimthursar clan’s mountain abode to rescue Bolvarr and Hrimnir, Bolthorn’s brother and cousin, who are presumed captured by humans. This requires Arianna to travel home to Gautar, a place she associates with fear, abuse and manipulation. Now that she has the tattoos of an orc bride on her face, she can add likely persecution to that list of horrors. Arianna and Bolthorn will need to be at their strongest and rely on each other and their friends to overcome the many travails of the expedition. In the manner of Tolkien’s ring fellows or the dwarfs as they sought to reclaim their home, the quest is filled with hideous creatures, injuries, betrayals, and scarcity of food and shelter. Then, as Arianna and Bolthorn reach what they thought was their destination on the edge of the Gautar lands, they find they must move on to even more dangerous territory. Supposed allies carry hidden depths, influences and shifting loyalties, making this a story where it is impossible to know friend from foe. However, as Arianna and Bolthorn immerse themselves in ever more hazardous situations, Arianna begins to grow into her elven blood heritage. Her blossoming magic is a wonder to witness. Not only are Arianna and Bolthorn on a journey through Gautar, but Arianna is on a journey of self-discovery. Her metamorphosis from the beginning to the end of this book is on a majestic scale. She starts as a scared, pregnant woman who lacks greatly in personal confidence and mastery of her magic. Again and again she rises to the challenge, on her way to becoming the queen that is assuredly in her destiny. Dillin details this rite of passage through suffering and understanding, and ultimately two different showdowns where Arianna throws off the shackles of her own insecurity and places them firmly on those who hinder her ideal of justice and honor. And trust me, one of these confrontations will leave you reeling. The beginning third of this book is the weakest, reflecting the ever-present worry and constant need for reassurances that plague both Arianna and Bolthorn. For his part, Bolthorn feels guilty over requiring the assistance of his pregnant and vulnerable wife as they journey to her homeland. There were also instances of repetitious conversations between Bolthorn and Arianna as if to reassure the reader that Arianna is good and worthy and humble. However, in these conversations she reveals the enslavement the orcs have borne for generations. Bolthorn recognizes it takes his “outsider” wife to reveal the hidden truths about the twisted relationship between elves and orcs. In some ways these somewhat circular conversations foreshadow and explain the desperate choices that Arianna will be forced to make later in the book. Do I think Arianna will become the instrument of sedition between orcs and elves? Yes, but I think that will be a tale for a future installment of the Orc Saga. It should be noted that this book is the continuation of a saga and it is absolutely necessary to undertake a prior reading of Honor Among Orcs. In the manner of a good movie saga, though, both stories wrap up immediate loose ends effectively so that you aren’t sitting on a cliffhanger for months. It is the shadow of rebellion on the horizon and family disloyalties that will bring you back for the next book. I received an ARC of this book from the author, but all opinions are my own. I reviewed "Honor Among Orcs" the first book in the Orc Saga, last year, so being able to be an early reader for "Blood of the Queen" was equally exciting. I will strive to make my review as spoiler free as possible from both books, but understand that a few details from book one are likely to slip into the review. The second part of Arianna & Boltthorn's tale begins not terribly long after the first ended. We find our intrepid duo recovering from the harrowing ending of "Honor" & trying I reviewed "Honor Among Orcs" the first book in the Orc Saga, last year, so being able to be an early reader for "Blood of the Queen" was equally exciting. I will strive to make my review as spoiler free as possible from both books, but understand that a few details from book one are likely to slip into the review. The second part of Arianna & Boltthorn's tale begins not terribly long after the first ended. We find our intrepid duo recovering from the harrowing ending of "Honor" & trying to start finding their places in Hrimthusar society. Arianna is (understandably) jumpy, while Boltthorn is rearing to get back into the role of Hrim-Gothi (at last so long as the other orcs agree, and if not, then into whatever the Ancestors have in store for him next). We get small glimpses into Hrimthusar life, & I'll admit to wanting a bit more of this. I understand why we are hastened into the story, & from a narrative perspective, it makes sense; however, I was left with a bit of longing for just a little more of orc daily life before diving into the tale. When the group makes it to the pass to Gautar, Isolfur leaves them because horses & long caves don't mix, no matter how magical a being might be. The separation from Isolfur allows for some great glimpses into just how unsure of herself Arianna is. There are so many things she does not know how to do with regards to being Boltthorn's wife that she often lets herself become overwhelmed. I know those struggles, & Arianna really spoke to me as they journey back to the land she fled. She is grimly determined to make that journey, though, in an effort to find Bolvarr & Hrimnir & to perhaps prove herself worthy of her husband. The fact that harsh voices from her past (namely her father & Vanadis) only work to increase the depth of Arianna's character because we all have those critical voices inside us. On the journey to Gautar & the journey into Gautar, Dillin does a masterful job at weaving genuine emotional feelings from all the journey party, but especially Arianna & Boltthorn. Yes, they are linked by love so thoroughly their thoughts laugh together; however, that does not mean that they magically have a perfect relationship. Each has their own fears that need soothing, & it quickly becomes clear that love is a great building block, but real relationships need work. Trouble finds them from the time they pass into Gautar, & spends the rest of the book dogging their footsteps. In that regard, "Blood of the Queen" becomes much more than a simple adventure. Arianna & Boltthorn must work with each other & trust each other for the tasks they've been set, & as everyone knows, trust is not always easy, no matter how in love a pair might be. Going into much more detail will start running into spoilers for "Blood of the Queen", & I really want to avoid that, particularly on Release Day. That said, I do have a few small criticisms to note. As much as I love the very real interpersonal conflict between Arianna & Boltthorn, I wish that Dillin had spent more time on the second half of the tale than the first. In this case, I think I understand why there needed to be so much time spent building things between our heroes, but I feel that some of that building came at the cost of the second half of the story. While I suspect that some of the answers I seek will be made clear in the next book in the Orc Saga, I'm not the most patient person, & so, I'd have liked a few more answers now. The second half is great, adding in multiple unsuspected twists & I LOVE that; I just would have liked more. I loved this one just as much, if not better than the first one. Seriously, though, if you like fantasy, a touch of romance, political intrigue, magic, any of the above combined with engaging writing and complex, interesting, and likable characters in a well-developed world you must read this series. I'm so glad I had a chance to read this advance copy. A more complete review will be coming on our Booksellers Without Borders NY blog soon, but do yourself a favor and read Honor Among Orcs if you I loved this one just as much, if not better than the first one. Seriously, though, if you like fantasy, a touch of romance, political intrigue, magic, any of the above combined with engaging writing and complex, interesting, and likable characters in a well-developed world you must read this series. I'm so glad I had a chance to read this advance copy. A more complete review will be coming on our Booksellers Without Borders NY blog soon, but do yourself a favor and read Honor Among Orcs if you haven't so you're ready to dive right into Blood of the Queen when it's released. This sequel had a bit of a slow start but once I got into it, I couldn't put it down!! Bolthorn remains the awesomest and Arianna finally BECOMES awesome... which was nice because I kinda wanted to slap her a few times. But where is the next one? I need it now please. K thanks. I received a free copy of this book in exchange for an honest review. But I also bought it anyway. Eh, I liked it! There was this part where the two leads' thinking was in such perfect parallel that it was adorable!! XD The characters were interesting, the world-building was pretty good, the plot flowed, I'm definitely going to read the next book! In this second book of the Orc Saga, Arianna and Bolthorn return to Gautar looking for Bolthorn’s brother Bolvarr and his cousin Hrimnir who had gone there seeking information and failed to return. Much is made of their connection with the brook horse, Isolfur, on whom they depend to accomplish their goals quickly. The brook horse appears to be similar to the water horse whose story is told in Outlander, except that the brook horse assumes the shape of an actual horse on land and can turn into a In this second book of the Orc Saga, Arianna and Bolthorn return to Gautar looking for Bolthorn’s brother Bolvarr and his cousin Hrimnir who had gone there seeking information and failed to return. Much is made of their connection with the brook horse, Isolfur, on whom they depend to accomplish their goals quickly. The brook horse appears to be similar to the water horse whose story is told in Outlander, except that the brook horse assumes the shape of an actual horse on land and can turn into a man in his underwater home. He can also travel through water, including underground streams, at a high rate of speed while keeping his rider dry (if he wants to), and this is the ability Arianna and Bolthorn are counting on. But Isolfur keeps failing to show up when he is needed, and when Arianna, at last, agrees to go with him to his underwater home so she can talk to him, she finds out that he has a completely different agenda than what they had thought. They also discover that Sinmarra has come to Gautar, leaving horrible wolf-things to roam over the land. She has also taken over the castle, where Arianna’s brothers now rule the country in her father’s place. They infiltrate the castle and free Rodric and Isabella only to flee across the countryside. It is not until Arianna has her talk with Isolfur that they have any hope of getting on to the next place they need to visit – the kingdom of Hunaland – to find out from her grandfather, if they can, what is the source of the mysterious power in Arianna’s family and how they might use it to defeat Sinmarra. Overall it continues a good story. But it was frustrating how much came up to block Bolthorn and Arianna from their goal. And sad that there is likely still more pain and suffering before they can (hopefully) defeat Sinmarra and restore everything to its natural order. So, you're looking for an adventure? Why not add romance, and intrigue? Throw in a bit of magic, and clashing of steel and you'll soon be invested in the world Dillin creates. I was pleasantly surprised to find that BLOOD OF THE QUEEN began right where HONOR AMONG ORCS left off. Following the discord that was left in Vanadis's wake, Arianna is left feeling that she has the weight of the world on her shoulders. Make no mistake, she is no wilting flower. I liked the character progression of Ariann So, you're looking for an adventure? Why not add romance, and intrigue? Throw in a bit of magic, and clashing of steel and you'll soon be invested in the world Dillin creates. I was pleasantly surprised to find that BLOOD OF THE QUEEN began right where HONOR AMONG ORCS left off. Following the discord that was left in Vanadis's wake, Arianna is left feeling that she has the weight of the world on her shoulders. Make no mistake, she is no wilting flower. I liked the character progression of Arianna, and how her fears were always swatted away by Bolthorn. I was also very excited to learn a bit more about Isofur. It is clear that this is no happily ever after kind of book, and there is still more hardship to come for these two that lingers on the horizon. Dillin has done a fantastic job creating a world that is both unique, and believable. The interaction between Arianna & Bolthorn felt real, and I felt that I could relate to the characters very well. They are certainly in my mind long after I have finished reading. I would highly recommend this series, and for those of you who are not yet familiar with this series to please not hesitate picking up HONOR AMONG ORCS. You will not regret it! Fans of Amalia Dillin will not be disappointed. I cannot wait to see where Dillin takes us next. Amalia Dillin continues to impress with her romantic fantasy. The human Arianna, as a character, truly comes into her own during this second book in the Orc Saga. She is a well-developed main character who is passionate but often ineffectual at doing what is best or what is right. She questions her every step, every decision, until she learns to stop worrying and start acting in her best interests. She and Bolthorn (her orc husband and clan chief to his people) must ride into danger to save not on Amalia Dillin continues to impress with her romantic fantasy. She and Bolthorn (her orc husband and clan chief to his people) must ride into danger to save not only the orcs but also the humans, elves, and everything else. They never know quite who they can trust nor what they can hope to accomplish when they arrive. It makes for a daring adventure with tense moments of action and suspense. Together they must challenge the powers that be and there is no guarantee they'll both come out the other side. There's a brief lull in the middle where the characters' frustrations at being unable to act or make decisions crosses over into actual frustration on my part, but it is thankfully very brief and then the story gets moving again. Finally finished Blood of the Queen. The sequel retains its mystery that even surpasses the first one. The revelations unfold is a surprise I didn't saw coming and surely give the third book a wide area to explore. I can't wait to find out what will become of Arianna and Bolthorn. I hope they will come victorious and have their love, peace, and happiness. Amalia Dillin's Orc Saga continues to intrigue and immerse me with her wit and deep writing. The creativity shown in every chapter will make y Finally finished Blood of the Queen. The sequel retains its mystery that even surpasses the first one. The revelations unfold is a surprise I didn't saw coming and surely give the third book a wide area to explore. I can't wait to find out what will become of Arianna and Bolthorn. I hope they will come victorious and have their love, peace, and happiness. Amalia Dillin's Orc Saga continues to intrigue and immerse me with her wit and deep writing. The creativity shown in every chapter will make you turn every page to know what will be uncovered in each of them. A great and satisfying read for all. Getting to dive back into the Orc World with Arianna and Bolthorn was so wonderful! This book kept me hooked and guessing from beginning to end (and on the edge of my seat in some parts!) It was a great second book to Honor Among Orcs full of adventure and romance. I would love to know more about Arianna's horse, Isolfur and the backstory to that. Overall, a wonderful sequel and great story in general! Just finished this second book and it is just wonderful! The story of Arianna and Bolthorn continues and is truly epic. The rest of the characters in this story are magical and I can't wait to see the next book! Great part two and I am not clamoring for part 3! Wonderful Indie author worth a read. Another great installment of the Orc saga. I am very curious to know where the plot will take us next. the first book was utterly amazing and this one was very good as well, but I do have one complaint: there is absolutely no resolution atvthe end of this book like there was in book 1 instead it just stops like she wrote a super long bok and then cut it in half and gave us the first portion. this suffered the middle trilogy syndrome for me. Still good, just didn't move the story forward enough and spent too much time re-hashing the same feelings of guilt, insecurity, etc. hopefully the third book will bring it back to its original intensity and creativity.